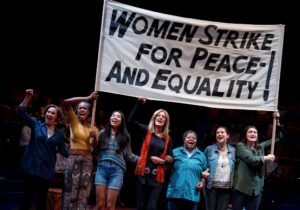 (L-R) Joanna Glushak, Fedna Jacquet, Francesca Fernandez McKenzie, Christine Lahti, Patrena Murray, DeLanna Studi, and Liz Wisan in GLORIA: A Life by Emily Mann, directed by Diane Paulus, at the Daryl Roth Theatre. Photo © Joan Marcus. A few days later, I related my astonishment about the guards’ reaction to two other thirty-somethings–one male, one female–whom I know to be college-educated, media savvy and squarely in favor of equality for women.